The exotic animals market in Barcelona is a prosperous business but I am not here to denounce anything. Many things are not right in this world. It is just this stupid obsession we humans have to collect things up. I will merely show you the frighten face of this beautiful Pyxicephalus adspersus or African Bullfrog. 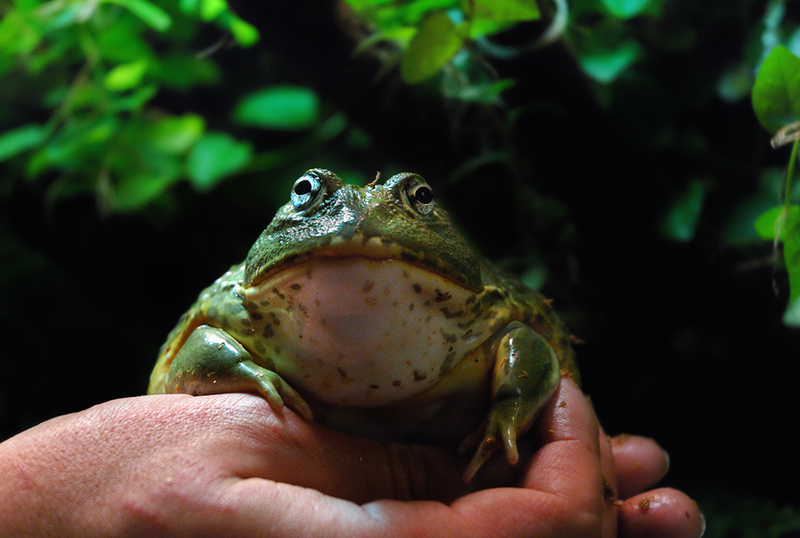 Check this other bullfrog image by Phil Bishop found via CalPhotos database. I had to look at several pictures to find the correct name since I foolishly forgot to take it down properly. Well, in fact he doesn't look scared but I imagine he must be under stress in the hands of this disgusting pale being that curiously comes everyday and feeds him. Here is a comprehensive database on amphibian species: AmphibiaWeb. It looks very frightened. But great shot of the eyes, they look wild. Ele parece na verdade assustado! Si si parece assustado. Obrigado.